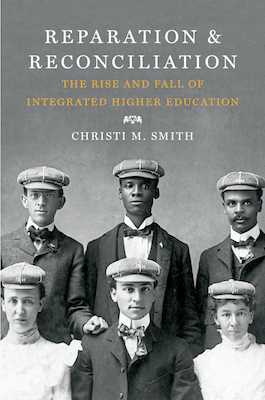 In her new book, Reparation and Reconciliation: The Rise and Fall of Integrated Higher Education, sociologist Christi M. Smith reveals a largely forgotten history of early efforts to integrate higher education in the years following the Civil War. This history pushes us to consider the relationship between higher education and political rights, the complexities of external pressures facing educational organizations as they negotiated integration, and the lessons that colleges and universities can learn as they confront their role in histories of injustice. In 2001, I moved from Washington, D.C. to rural Northampton County in northeastern North Carolina to teach high school. On my early morning drive to work, the fog hovered over cotton plants and crumbling plantation houses. It was to this county that planter whites fled during Nat Turner’s rebellion just over the state line. My attendance rosters listed few last names; indeed the small number of shared surnames made painfully clear the historical links between African American and white students. A few years later, I began doctoral studies in Education Policy and Sociology at Indiana University. Thanks to one of my former high school students who considered applying to Berea College, I developed an interest in unraveling the early history of diversity and higher education that led to this book. In looking at the website for Berea College, I was surprised to see that Ebony had hailed it as a top campus for African Americans. Having family in Eastern Kentucky, I did not expect the region to garner recognition for interracial cooperation. I wanted to know more. I was awed by Berea’s 19th century radical past. Just as one point of evidence: in 1872, the Board of Trustees wrote a statement in support of interracial dating. That was nearly one hundred years before the U.S. Supreme Court decision in Loving v. the Commonwealth of Virginia (1967). So often, the history I had learned focused on a narrative of increasing progress, as if each new generation were more ethical than the previous and mobilized to demand justice. I realized how little I knew about Reconstruction, and the era raised a host of new questions for me: What factors can inhibit racial discrimination? How can social justice victories be lost? How would our sense of possibilities and strategies for action change if we wrote history to include the turbulence? Would understanding the distance between legal victories and implementation failures push us to demand greater vigilance? And, perhaps most importantly, could we learn how to design better organizational implementation and monitoring efforts? And so began years of sleuthing in archives – from New Orleans to Maine, and with significant sojourns in Washington, D.C., Kentucky, and Ohio. In doing so, I found a framing of racial inequality that has largely been abandoned: racial prejudice as a caste system. The Anti-Caste movement viewed ending slavery as preliminary to the larger objective to “break down the barrier of caste” by transforming whites’ notions of racial superiority (Fairchild 1860:27). In other words, Anti-Casteists viewed slavery as a particularly brutal product of caste-based oppression, but believed that real change demanded eradicating the meanings whites attributed to racial difference. Here was their reason for focusing on education: whites had to unlearn their sense of innate superiority and develop leaders for a multi-racial democracy. If we saw our current system – and its inequalities which negatively impact African Americans on measure of health, education, wealth, and more – as a caste system instead of the result of individual prejudices, might we garner more traction in remedying systemic inequalities? Reparation and Reconciliation explores how a network of actors, in the U.S. and with ties abroad, developed the idea of higher education as a space for post-war national healing, where African Americans and whites would learn and socialize together, and these interactions would lead to broad and systemic political transformation. Along the way, I have often been asked whether their efforts truly reflected a belief and desire for racial equality. Certainly, it is hard to discern motivation but I looked to the actions they took and to what they wrote when they did not imagine they were speaking to the public. Of course, there are no opinion polls from the time to use to understand how Americans saw the way forward after the Civil War. Instead, I constructed a database of newspaper articles from major Northern presses to learn how Northern journalists described the problem of Reconstruction. This prioritizes the opinions of elites, of course, but elites were also responsible for channeling the range of possibilities that were even considered by empowered actors. At the Amistad Research Center at Tulane University, I read though more than seventy years of organizational materials – including personal letters, expense reports, sermons, speeches, and magazines. Here, I wanted to see what kinds of resources made their ambitions possible and where they faced constraints. What was life like for students and faculty on interracial campuses? Did prejudices on campus cause rifts and undermine efforts for integration? To be able to delve into great depth, I focused on how these efforts for interracial education played out on three campuses – Berea College, Howard University, and Oberlin College, each of which adopted a unique strategy and had very different measures of success. Berea enrolled nearly equal numbers of black and white students, Howard had nearly 20% white students in its medical training program with smaller numbers in other areas of study, and black student enrollment at Oberlin College ranged between 5-10%. At the campus archives, I looked at both organizational materials (college catalogues, finances, Board of Trustee minutes) and the personal materials of students and administrators. I read love letters and laundry lists. In short, I thought of my approach as historical ethnography – I wanted to understand how the moment felt to the actors as they were living it, when they had no idea what the future would hold. But ultimately, the pressure points that drove segregation did not come from interactions on campus. The American Missionary Association leadership envisioned a future when African Americans would be “a pastor of your churches, a president of your colleges, a leading partner of your great commercial houses, a President of the Republic” (AMA Annual Report 1867). To accomplish this, they advocated creating small, bounded communities – college campuses – where blacks and whites would come to “recognize each others’ humanity” (Fairchild 1875:66). In 1865, the Chicago Tribune encouraged its readers to look to Oberlin that had “solved the social problem of the nation.” Their motivation for “co-education,” or integration, was rooted in framing prejudice as a threat to republican governance and stability. Yet, despite their differences, by around 1900, each had backed away from interracial education as central to their mission. In the book, I show how that as higher education coalesced into an organizational field and these interracial colleges changed their practices around diversity (both in terms of race and gender) as a reaction to being evaluated and appraised by foundations and others engaged in ranking colleges. There was enormous pressure to align to new standards for higher education – and that included making changes to their admissions practices to insure enrolling more white males to match demographics at elite eastern colleges. As a result, Trustees voted to spend more on gymnasiums and sports, and in some cases even let trusts created to fund scholarships for African Americans students sit unused. Once again, we see a dramatic increase in college enrollment and a deep fractionalization by race and class in the form of higher education students attend. Between 1995 and 2009, freshman enrollments increased for black students by 73 percent. Despite this increase in enrollment, white and black students attend dramatically different types of higher education. Roughly 70% of black students entered open enrollment or two-year college programs while 82% of new white students entered the 448 most selective colleges in the United States. In other words, we see dramatic success in increasing access to higher education but this occurs in a dual system of racially separate pathways. My hope is that recovering the hidden histories of early efforts towards egalitarian integration will force us away from accepting our current pattern of resegregation and renew vigorous effort for educational equality. While a number of campuses have taken a scholarly approach to investigating how connections to slavery, such as an initiative led by Eric Foner at Columbia University, even more innovative projects bridge research with community engagement in pushing for change to on-campus practices. One example for how we can build from difficult histories is the Transforming Community Project that was launched at Emory University by Leslie Harris and colleagues. Emory brought together actors from across campus to design ways to incorporate the university’s history into new ways of working towards an inclusive community. These kinds of initiatives are promising for recognizing the ways in which legacies of inequality have been built into higher education. Frank Bruni. “The Lie About College Diversity,” The New York Times, December 12, 2015; Carnevale, Anthony, and Jeff Strohl, Separate and Unequal. How Higher Education Reinforces the Intergenerational Reproduction of White Racial Privilege, Washington, D.C.: Georgetown Public Policy Institute, 2013; James H. Fairchild, Oberlin: Its Origin, Progress and Results (Oberlin, Ohio: Butler, 1860); Edward H. Fairchild, Berea College, Ky.: An Interesting History (Cincinnati: Elm Street Printing, 1875); Nathan Heller. “The Big Uneasy: What’s Roiling the Liberal Arts Campus,” The New Yorker, May 20, 2016; Gillian B. White, “How Money From Slave Trading Helped Start Columbia University,” The Atlantic. January 25, 2017. Washington, D.C.: Georgetown Public Policy Institute, 2013; James H. Fairchild, Oberlin: Its Origin, Progress and Results (Oberlin, Ohio: Butler, 1860); Edward H. Fairchild, Berea College, Ky.: An Interesting History (Cincinnati: Elm Street Printing, 1875); Nathan Heller. “The Big Uneasy: What’s Roiling the Liberal Arts Campus,” The New Yorker, May 20, 2016; Gillian B. White, “How Money From Slave Trading Helped Start Columbia University,” The Atlantic. January 25, 2017.